Some people call us empaths, intuitives. Biblically, we are said to have the gift of discernment. Still others chalk it up to wisdom. Whatever you call it, there exists in some people the innate, intangible ability to discern, to sense and perceive truth, motivations, emotions, and even sometimes the paths of other people. Not psychic abilities, not a parlor trick, but a genuine, God-given ability to recognize and empathize. 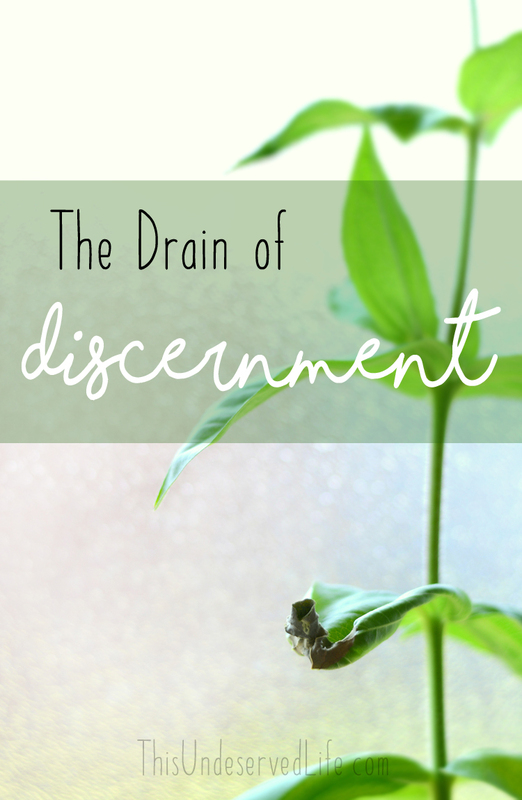 Before I knew what it was, I had this gift of discernment. As a child I knew immediately who I did and did not like, who I trusted, who was putting on a show. I felt others’ sadness deeply and mourned with them long after parting ways. I sensed their anxiety and insecurities. I bristled at their manipulations. I felt an intense connection with animals and more often than not spent birthday parties talking with my friends’ parents. I didn’t always like every one of my parents’ friends, and people who wore masks did not appreciate that I could see through them. In all, it made for a very, very cynical kid. As an adult who now recognizes and trusts in this gift, I’m exhausted. I’m almost the very definition of an extrovert. I absolutely love being around people, draw my energy from crowds. Yet I crave alone time. I thought it was because I’m a stay at home mom and it’s really freaking hard. I thought I was one of those ambiverts or an outgoing introvert. I could not figure out how I’m both energized and drained by human interaction to the point of irritability, fatigue, even sadness. Then I realized it – I’m tired because it literally does drain me. To be constantly searching others for their emotions, their motivations, to be hyper aware of subtleties and sideways glances. I’m never just around people, I feel people. Sensing others’ emotions and manipulations can really make someone skeptical, disillusioned, even pessimistic. That’s a hard load to carry, and often it’s carried alone. I’ve been accused of being judgemental, harsh, bitter. I’m not perfect, and I definitely wander down those paths sometimes, but when you voice your doubts about someone you tend to look like a jerk. When you don’t fall for shows it’s impossible to wear rose-colored glasses. I’ve felt so strongly before that certain people were not who they presented themselves to be that I’ve doubted myself. I’ve examined my motives, reasons. Was I jealous in any way? Had they slighted me? Do they wear Crocs regularly? I couldn’t put my finger on my uneasiness, especially in comparison to seemingly everyone else’s adoration. Once I even approached a person and apologized to them for the feelings I had that prevented me from developing a relationship with them. And you know what? Every single time my gut was right. Even the person I tried so hard to like, the one I embarrassed myself by approaching and apologizing to. Every time, every one, they showed themselves to be toxic, harmful people. These alarms going off inside, the gut feeling, the voice of God, they were all discernment, and though I often stood alone in my feelings, I stood in truth. Questioning someone’s motives when you’re uneasy around them doesn’t make you any more judgemental than locking your front door does. But it does make you look like a pretty harsh person to others who don’t have the same sirens blaring inside. So it gets lonely. It gets sad and hard to be the one who naturally mistrusts some people. It’s also really sad and hard to empathize. I love people. Genuinely love people. I want the best for them. I love to help, love to encourage, love to hug. Don’t get me wrong, I like my space and alone time and get really flippin’ frustrated in parking lots (where the worst of mankind always manifests), but I love people. I like talking with them, laughing with them. I cannot go anywhere in public without being drawn into conversation with a stranger. I earned my degree in counseling because I feel so called to help and get the most incredible rush from being able to do so. I can’t always offer my time, I can rarely offer money, but I can offer my empathy… and that mess is draining. What a privilege to share in life’s greatest emotions with others, but what a struggle to also feel them. I would never wish empathy away, but I do wish for a nap after a particularly heavy conversation. I do wish I could watch movies about injustice or grief and not feel such overwhelming guilt. The feelings are deep. They don’t compare to what someone is going through, obviously, and I would never tell someone I knew exactly how they felt, but what I do feel is intense. Trust that if you have shared your struggles with me, I am feeling a tug for you all day. When I tell you I’ve been thinking about you or praying for you, it’s genuine. Taking on others’ pain, sadness, even joy means taking on more emotions than you yourself would normally feel in a day. You feel enough for one person and then some. I cry way more than I’d like to admit, and sometimes just from how overwhelming all the emotions are. It pulls from you, in ways that cannot be measured. Attempting to explain this fatigue can get you a lot of eye rolls and heavy sighs. It’s tough to explain just how much it pulls from you to care so deeply, but oh, what a wonderful gift it still is. While our hearts run the risk of hardening towards others because of mistrust, they remain tender with this concern we experience. Ah, our hearts. Such tricky things. We straddle the line between doubt and empathy, using our energy to constantly evaluate those around us – though such feelings aren’t really quantifiable. We’re not ranking, we’re not judging, we’re feeling. And those feelings guide us to a position of silent power that can all too easily be used to manipulate. Our own hearts have to be examined regularly. We feel things others don’t, we know things others don’t, so we sit with this information and are faced with the question of what to do about it. Do we warn others? Do we approach them? Do we just avoid this shifty-feeling person? Or do we use these feelings, this “knowledge” to our advantage? Too many use the ability to read others for their own gain. They sense the relationships of the people around them and play them off one another. They pick up on the egos and the insecurities and hold onto them like poker cards. They lie with incredible ease and skill, knowing just what to say and how to say it. Because of the connection to others’ emotions, they can truly mean the untruths they tell, convince the trusting others. We must keep watch over our own hearts, that whole “with great power comes great responsibility” thing. I haven’t researched it and I haven’t asked others who I know observe with discernment and empathy, but I have a theory about us: we’re beacons. Those people I speak with when out running errands, they approach me. Every time. I’ve tried listening to my iPod, I’ve tried taking kids with me, I’ve tried Resting Jerk Face, and still I am approached by any and all kinds of people, chomping at the bit to share their stories and struggles with me. I’ve asked for years, how do they know? What about me draws them to me? Why, after a shift of seeing hundreds of people come through their line, did this cashier choose me to share her broken heart with? Because we all feel. We all experience emotions. And something about those who can feel the emotions around them calls out to those who are too overwhelmed to feel them alone. I remain convinced of my Father’s love by this, that He has placed people around us who are equipped to share the heavy load. These gifts we have were placed with purpose and intent. Some sing, some write, some do math, some speak, some dance, some paint, some teach, and some feel. It is a gift not just for ourselves, but the people around us. It can serve to both protect and heal, warn and serve. The people who need us will find us, and the people who don’t convince us will remain guarded. We can’t quantify this gift, we can barely prove it, yet almost everyone around us can recognize it enough to react to it. So we find ourselves drained, emotions and doubt and anxiety and conviction having pulled so much from us. We can feel like we’ve lost ourselves, given away so much of ourselves or taken on so much of others. After 10 hours of sleep emotional exhaustion can still remain. The inability to turn off the radar, the intuition, to remain in a state of vigilance, it creates a state of emotional tenseness, always taut, always waiting, always feeling. We’re watchdogs. It can feel like more is taken from us than we freely give. We don’t often have the luxury of optimism to energize us, because this very surreal gift keeps us firmly planted in realism. And realism tells us we’ll be tired again tomorrow. We must seek out opportunities to be alone, to process these emotions, to be granted reprieve from feeling everyone in the room, from being sought out and so heavily relied upon. We must give ourselves rest, find others who pour in as much as others siphon. We must recognize the toll discernment takes on us and actively protect ourselves from becoming emotional roadkill. As you acknowledge this gift you have, acknowledge the impact it has on you. You know, since with great power comes great responsibility. Go forth, go feel, go rest. omg. ur my twin, lol. Great article and yes i needed to read this. TY. my being overwhelmed by my gift isnt just me. It’s awesome to hear there are others with this gift. To date I only know of one other person with this gift. She is a precious sister and we share and build each other up which helps with those moments of overload. May we all learn to walk in it, use it for His glory and to help others. Thank you so much for sharing this. It’s so validating and nice not to be alone. I love your article. It has a way of explaining this in ways my husband can’t. I do have questions though if you would be able to shed some light. Its a complicated situation though. My husband and I have a friend couple, they are our very best friends. The wife in the couple has this gift just like my husband. I sometimes feel jealous with how much they communicate. Regardless of the gift they both have and the love and trust I have for both of them I am very jealous. I cant fully explain why. She is like family. I trust both of them. Its the emotions they share and she is still another woman taking my husbands attention. This is the best writing I’ve seen to describe what I’ve never been able to articulate. It’s do nice to know there are others like me. It’s a truly lonely yet overwhelming existence. I’d only known one other “empath” (if you will), but I’ll hold on to this article and read it again and again. Previous Previous post: Where Did My Fun Go? Next Next post: Pause. Take a Breath. And Choose a Child’s Life Over Irritation.